Fulham is proud to announce the release of a new family of SIG qualified Bluetooth mesh products. The core component is the revolutionary WorkHorse LED "Connected Driver". The T2C1UNV150P-40L is a programmable 40W, 0-10V constant current driver with the unique ability to add Bluetooth mesh connectivity by attaching a simple plug-and-play Bluetooth antenna, called a SmartLink (part number ESLI01HB01). Bluetooth mesh is an emerging platform for connected lighting that provides fast, reliable performance, unmatched scalability, high-level security and out-of-the-box interoperability. It can simultaneously connect hundreds or even thousands of devices, creating opportunities for larger, more efficient lighting networks. In tandem with the connected driver, Fulham has released its new eliteBlue commissioning software, which provides an intuitive set of tools for commissioning and monitoring qualified Bluetooth mesh lighting devices. There are two pieces to the new software: the eliteBlue web portal, which is used offsite to manage lighting installation projects, and the eliteBlue mobile app for iOS, which is used onsite to commission devices and fine-tune installations. 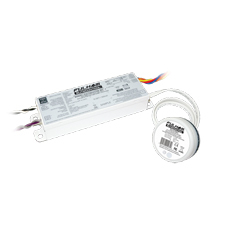 Two new wireless, self-powered switches designed for use with Bluetooth lighting installations are also now available. These EnOcean® switches harness the energy created by pressing the rocker pad to communicate via the 2.4 GHz Bluetooth Low Energy (BLE) radio standard. T2C1UNV150P-40L: 40W programmable driver, UNV input, 0-10V/Bluetooth dimming, 250-1500mA, 10-57VDC, cULus Listed, CE, 6.61" x 1.97" x 1.18." ESLI01HB01: Bluetooth SmartLink, 1.99" diameter x 1.33" height. RJ12 connection to driver to enable Bluetooth control. ESRPB-W-EO: Single rocker EnOcean switch for Bluetooth, 4.95" x 3.21" x 0.74"
EDRPB-W-EO: Double rocker EnOcean switch for Bluetooth, 4.95" x 4.52" x 0.72"